The Peanut and I went yesterday. I'm not super awesome at the whole finding a place to park thing or the road closure thing. Soooooooo we turned off the freeway. We parked at a hotel and walked over. Since I'm still battling out this awesome sickness that started Thursday night, I figured the fewer people I was around the better. Turns out we saw Aimee first. Holy cow. She looked amazing. AMAZING. Peanut &amp; I were yelling like a bunch of crazies, "Aimee!! Aimee!!" [in my awesome I'm a closet chain smoker voice]. To my surprise she noticed us! And. stopped. to. hug. us. both [?!?!] Loved. That. Then we moved over a few steps to the metal railing. Peanut had made the awesomest sign. Brought out all sorts of smiles, laughs &amp; comments from the athletes which was awesome. *can I be your random person? I was so happy she came with me. I loved seeing her watch all the incredible athletes. I loved seeing her face. Especially when we saw these two individuals. Well until about 2 minutes after each of them passed and she said . . . .
"Mom, I bet someone told them they'd never be able to run again." "I guess, I should never say I can't run a 10k." It was at the top of a short [hehehe hill]. People who saw the hill and . . . .
Then, the moment had arrived. Only [sarcmarc] Mr. PRR himself. We rang our cowbells like crazy people. Peanut hurried and flipped her sign over to "GO PUNKY!" And I tried to act as normal as I could............what ever. We freaking screamed at the top of our lungs! Then, I seriously ditched my phone, my bell &amp; my knowledge of IM rules to my girl and ran off with him. In flip-flops. Powerful!!! I am planning to volunteer & spectate at IMLP next year and seriously can not wait. I'm sure there is nothing like it! Awwww... what a great day! Aimee had a huge smile on her face! So glad that you and Peanut got to experience all that crazy that is Ironman. Can't wait to cheer with you next year!!! What a great time for you!!!! I was so very excited to see the pic you posted of Aimee on Twitter! I had been tracking her all day and it was so great to see how good she looked! Thanks! Go Random Person! I love it! And such great insight into those 2 athletes - someone(s) probably DID tell them they couldn't do this. EF "can't"!! Sounds like you had an awesome time. I love spectating with my son and always find that he has a blast. Very inspiring post. So are you in for next year? 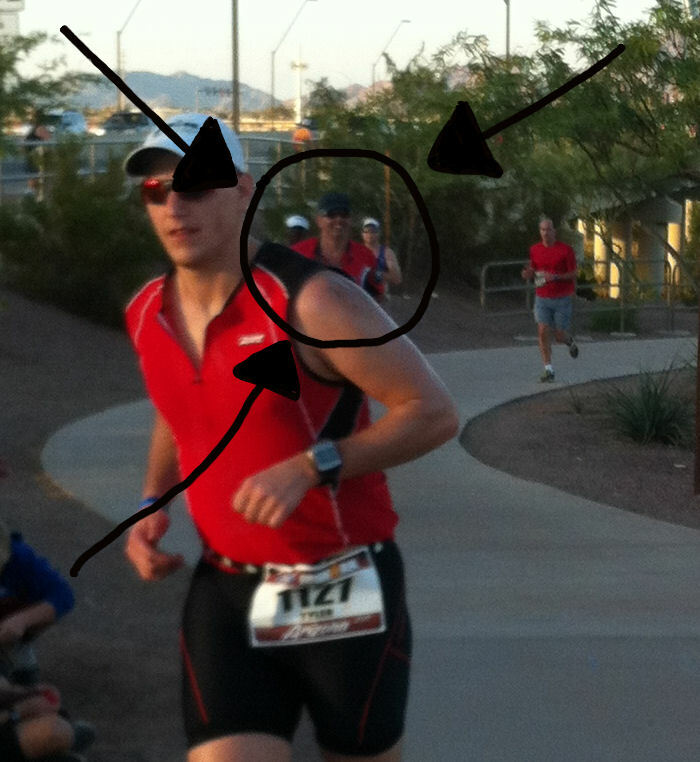 BEST race spectating report ever!! Isn't it a blast to cheer an IM??? I think I could totally go pro as a cheerleader! SO cool you got to see Amiee!! She is freaking awesome!! AND PUNKY!! YAY!! What fun. I want to come cheer with you guys! I was stalking my friend in that all day yesterday! Great signs!! you know we were supposed to me there, but the hubs' knee injury got in the way. Man, i wish i could have gone, just to cheer with you! and bring you GF goodies of course. I love spectating races, and it sounds like you and Peanut had a blast! Awesome! Thanks for the great recap with the pictures. Just found your blog and I was excited to see there is someone else out there who loves the treadmill as much as I do! Will be following from now on! I love watching Ironman races. It's so incredibly moving. I have volunteered the last three years as well. If you get a chance, volunteer it's amazing to get a chance to help those athletes out. This year I took my two older kids to help and they love it too, we made a day of it, so fun. I saw Amie on the run course by transition she look so fresh and smooth, she really rocked it our there. Fantastic! I so need to spectate an IM SOON! In love with Peanut's sign! Just love your athletic apparel and I would also recommend http://www.apparelnbags.com/athleticwear-athletic-shorts.htm for some good athletic apparel.